I was thrilled to be invited to the 1st ever Frabelle Foodie Chef event. The straightforward name says it all – it is all about food. And by that, I mean lots of good food and equally good chefs. The event, held at Wine Bar Cafe 1771, featured great food enthusiasts, chefs, culinary experts, and unlimited Frabelle Foods— all in one place. It was a beautiful way to try so many types of delicious dishes from Frabelle Foods, and discover amazing chefs, many of whom are based right around the corner, but we’d never even heard of before. For that reason, the event really connected me to the spirit of my love for food, discovering new, exciting things as well. 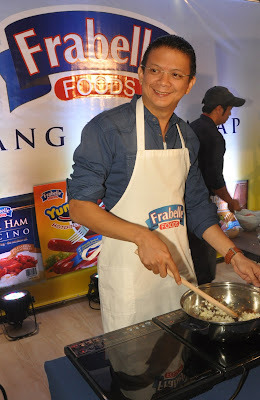 Frabelle Foods' ambassador, Sen. Chiz Escudero, who considers himself a Frabelle Foodie Chef at heart, shows his culinary enthusiasm and impeccable taste once again as he judges the 1st ever Frabelle Foodie Chef Finals, a Facebook promotion of Frabelle Foods. The 1st Frabelle Foodie Chef competition started last October 22, 2012 inviting all food lovers and consumers of Frabelle Foods in the Metro Manila area. Participants were asked to come up with their own recipe using any of the delicious Frabelle Foods product namely Yummy! Hotdogs and Cheesedogs, Pork Ham Tocino, Longganiza Hamonado, Hickory Smoked Bacon, and Honey Ham. After a two-month online search, Frabelle Foods revealed the 5 finalists of the said competition selected from the numerous entries aspiring to be the grand winner. All these entrees hit the spot. They look pretty darn good and I love every single one of them because I’m generally a meat lover kinda girl. I can eat all of them easily and they are all tasty! Frozen meals have come a long way and I’m thankful for Frabelle Foods’ great quality and taste in food! So can you guess who the winner is just by looking at these photos? Well, this picture says it all. Neneth Madrona was declared as the winner of the competition. Having beaten out four other equally talented foodies, Neneth was chosen as the winner of "The 1st Frabelle Foodie Chef Finals." She's also the Blogger's Choice and Media's Choice. Guess what? She also got my vote. Thanks to her signature and uniquely satisfying stuffed chicken , the 1st Frabelle Foodie Chef Grand Winner received Twenty Thousand Pesos (P20,000) and a one day Culinary Class at the Center for Culinary Arts in Manila. In addition to sampling the dishes and voting for the best dish, a sumptuous lunch, and finding some delicious recipes to try, there were other random drawings for prizes. So how did she win? Two words. Stuffed chicken. Oh, wait. I believe it is... FRABELLE FOODS. And yes, it was a really good stuff! The judges called parts of the dish "absolutely good with a distinct taste of Frabelle Foods products in it". It is something that would impress judges with very discerning palates. I also got the chance to talk to her this morning and she said that she really loves cooking stuffed chicken. Her secret ingredients? Frabelle products! What she really likes about her Stuffed Chicken, aside from how they taste, is how quick and easy they are to prepare. She also put a bit of seasoning so one can easily distinguish the taste and flavors of mixed yummy goodness of Frabelle Foods products. When I ask her what is her secret, she answered, "My secret? Nagpaka-Frabelle lang ako. No red wines. No high end ingredients from Santi's... It's that simple! A whole chicken that I deboned, mix veggies, rolled oats and Frabelle for stuffing". She said it's actually their “go to” meal when they don’t have anything defrosted and need something quick and easy to make. I agree with everything she said, especially about how quick and easy it is to prepare. Now, I'll make sure to keep at least one chicken and loads of Frabelle foods in the freezer at all times. I honestly never thought that chicken, and all those meat from Frabelle Foods would taste good together but it does. She put just the right amount of seasoning in the chicken too. She also said that if she puts more seasoning, it would be too much. And she's right! It’s just enough that you get a little bit of yummy, meaty goodness with every bite. Just like when Sen. Chiz Escudero is on a "Cooking Chef" mode, he was all smiles all throughout the food tasting. I bet he did enjoy eating each and every dish prepared by the finalists. 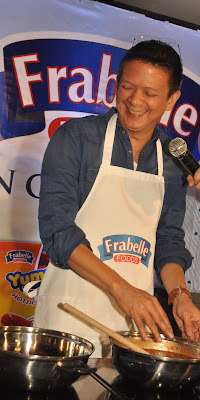 “I had no second thoughts about endorsing Frabelle Foods because of this, and the fact that it is a homegrown brand,” says Escudero. “Hindi lang mayaman ang may karapatan kumain ng masarap at malinis na pagkain at ang Frabelle Foods ay gawang Pilipino para sa Pilipino. Today's event was incredible! Thank you Frabelle Foods! Now to get some rest because I'm still stuffed from all the yummy dishes I've eaten today. Oh wait, while you're at it, don't forget to join my Year 5 Blogiversary Giveaway because 5 gift pack of Frabelle Foods products worth Php1000+ each are up for grabs. Yay! Don't miss out! Yummy talaga ng stuffed chicken. I knew she would win! Hihi!! The judging committee consists of Frabelle Food’s Chef and representatives and of course, Frabelle food endorser Senator Chiz Escudero. Where did she fall here???? facebook likes? OMG!!!! great dishes! if i was a judge here, it'd be really hard to decide..even if i only saw the looks of the dishes, i;d really say "great dishes"! Frabelle products are really yummy!